I cleaned up a few spring species along the lovely and locally legendary Lakeview Community Church Trail, but my best sightings were in the reeds in front of the more widely renowned Braddock Bay Hawk Watch platform. If you’re looking for highly confiding Marsh Wrens vocalizing and preening without a care in the world, I found your spot. Corey had a grand Memorial Day Weekend which was highlighted by a visit to the tern colony on Rockaway Beach on Saturday. And while he enjoyed the sheer spectacle of Common Terns, Least Terns, Black Skimmers, American Oystercatchers, and Piping Plovers all settling down to nest his Best Bird of the Weekend was one that was just passing through. 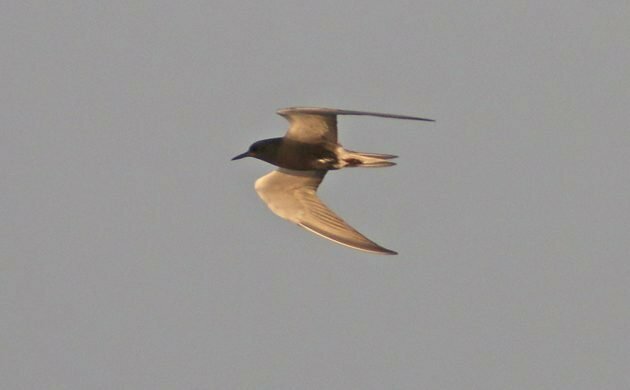 A Black Tern briefly visiting the colony was a good bird for Queens and Corey’s Best Bird of the Weekend. I have to go with the Secretarybirds. Especially getting to watch them go thru their mating routine on top of a huge nest! Where Are You Birding This Second Weekend of May 2015?